We all know the social media space is constantly changing, but our monthly updates can keep you in-the-know! You've probably noticed a lot of social channels updating their privacy policies. This is of course thanks to the European Union's new privacy law, known as GDPR (General Data Protection Regulation), becoming enforceable as of May 25. This law applies to any organization that collects the data of EU citizens, even if the company is in another country—so really, all organizations need to be aware of GDPR. One of the most important things to know about complying with GDPR is that each user must opt-in in order for a business to track and utilize that user's data. If you want to read a great run-down of how GDPR is effecting social channels and why it will probably be a good thing for most citizens, check out Buffer's blog post on the subject. The quoted text below comes from there, and we of course must emphasize that speaking to a legal advisor is the best route for figuring out what your business needs to do to achieve compliance. Your customers must be given a free and genuine choice to accept or reject (and be allowed to easily withdraw their consent). You have to state what data will be collected and how it will be used. The request for consent has to be in a clear and plain language. As there are very stringent requirements for obtaining consent, it’s best to refer to the regulations directly and check with your legal advisor. Prefer to listen to a GDPR explainer? This "Today Explained" podcast episode covers a lot of bases. *Snapchat's focus on "privacy by design" in their GDPR post is particularly strong. Updates on Facebook's battles with fake news, click bait, etc. With all the Facebook news constantly swirling, this "what's up with Facebook lately" segment seems to be becoming a monthly feature. Here are a few of the things we've noticed coming out from the Zuck team lately. Facebook is also testing a feature that will show users which of their friends have shared the article, as well as showing more articles from the publisher. Note: these updates are mostly geared toward "publishers" such as news sites and high-frequency blogs. Want to make the most of these changes? If you share original content authored by significant thought leaders, make sure you've implemented Author Tags which will highlight the author's Facebook Page information when sharing articles. Facebook is "A place for friends"
A quick look at the Facebook PR team's "Newsroom" is another study in how Facebook is trying to "right the ship" as far as its optics are concerned. We are seeing some good signs, such as the Article Context buttons above, but it still feels like we have a long way to go before all of Facebook's problems are solved. Larger Summary preview has increased from 220 to 300 characters. Company logo now appears at the top of your profile and links down the page to your experience. 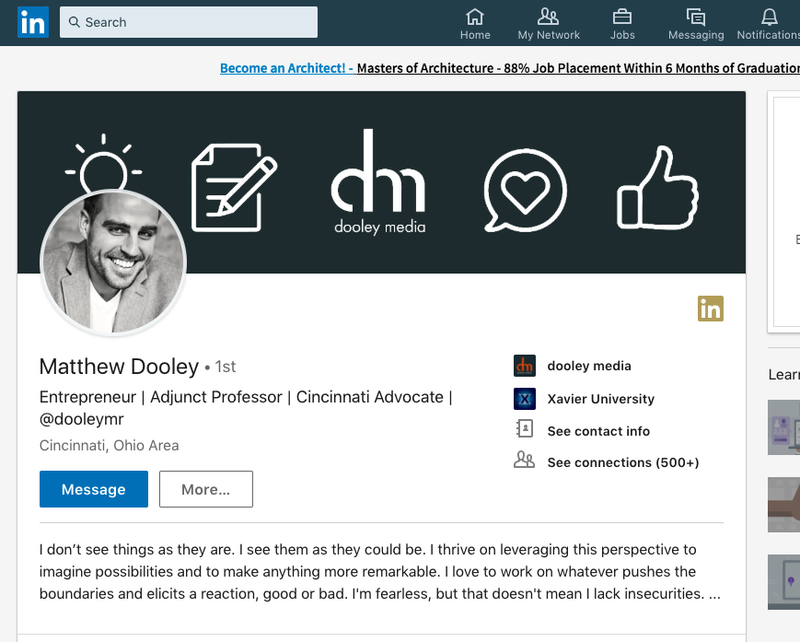 In the announcement for the new How You Match feature, LinkedIn says "knowing whether or not you’re a good fit for a role is one of the most challenging parts of the job hunt." How You Match aims to make this easier by comparing your LinkedIn profile factors (such as education level, skills, years of experience, and current job title) to what a company says its looking for in a potential new hire. LinkedIn will no longer share changes to past positions with your network. As is often to be expected, Instagram was busy rolling out what felt like dozens of updates over the past 4+ weeks. Some of the most interesting are highlighted below. Users can now basically "unfollow" an account without actually, you know, un-following them. By "muting" someone you will still be listed as a follower, but none of that account's posts will appear in your Instagram feed. Similar to the Poll function, the emoji slider is a new, interactive sticker you can use on Instagram Story posts. After users slide and release the emoji to leave a response, they will see the average score from the question so far. "By choosing an emoji for your question, you also add a layer of emotional context that helps those answering understand your tone and answer accordingly." This is a cool, new way users (and brands) can reshare content within Instagram—plus it's a new option for populating content on your story. Simply tap the paper airplane share button on a post you want to share and choose the new "Create a story with this post" option. You can then customize the background and size of the photo, as well as adding stickers and captions. The share will include the original author's screen name. Note: This will only work if the account is public. You might remember that YouTube has a service called YouTube Red that offers premium content and an ad-free YouTube experience. If you didn't remember that, don't worry because Red is officially being replaced by YouTube Music and YouTube Premium. Basically, YouTube Music will cost you $10 a month (after a free trial). It's a revamp of YouTube's existing music options, which are similar to Spotify or Apple Music. YouTube Music is also going to replace Google Play Music. For more info, Recode has a great article explaining all the ins and outs of the new setup. Announced in late may, Yellow is being marketed as “a launchpad for creative minds and entrepreneurs who are looking to build the next generation of great media companies.” This is an effort by Snap Inc. (owner of Snapchat) to invest in projects related to augmented reality, interactive design and narrative storytelling. For more info, check out the Yellow website at yellowla.com. Snapchat Quietly Rolled Out a New Way for Friends to Share Their Locations – AdWeek got the scoop here. Basically, by long-pressing on a friend or opening the chat hamburger menu, you can now request location access from a friend. Kinda creepy? LinkedIn Guide to Getting Hired in 2018 – Check out the top 10 most-applied-for job titles among 2016-17 grads, the top 10 majors that led to the most varied types of opportunities after graduation, the top 10 skills of grads that got hired, and more. How to Use Google Analytics for Social Media: A Beginner’s Guide – Here's a great resource for anyone looking to take their social media ROI measurement to the next level. Looking for More Social Media Help? The expert team at dooley media helps brands get attention by being thoughtful about how they give it. Our goal is to make every social interaction with your company a remarkable one. Get in touch to find out how a partnership with dooley media can grow your brand.